It was my friend Wendy’s best friend Mary’s YA book launch yesterday, so a crowd gathered at a Soho bookstore to drink wine, listen to her reading extracts from Wuftoom, and celebrate her fabulous achievement. I’d met Mary a couple of times before, most notably at Thanksgiving, where she pretty much summed up her life view as “if a giant talking bug crawled into the room, I’m one of those people who wouldn’t kill it because I’d be interested in what it had to say.” So I was kinda prepared for her book, a dark fable about a boy who turns into a particularly grotesque type of giant sewer-dwelling worm called a Wuftoom. 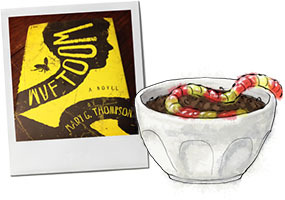 In keeping with the theme of the book, worm-related treats were served at the party – worms in chocolate pudding being the runaway hit. Glass of wine in one hand, jelly worm in the other, Mary looked happily around the room, taking in the moment. “I started writing this book and finished it within 6 months, because I found my job soul-destroying, and I needed to work out how to leave it,” she told us – inspiring stuff for a Sunday afternoon. This recipe contains raw egg, so don’t serve it to pregnant / fragile people, and use eggs that you trust. If you really want to make these egg free, use a tbsp of room temperature cream cheese instead – the pot au chocolate is more of a cheesecake filling, but there’s nothing wrong with that. This entry was posted in The Monday Treat, Uncategorized and tagged book, dirt, pot au chocolate, worms, wuftoom. Bookmark the permalink. 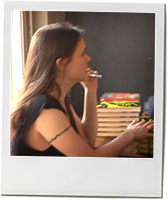 I love your blog, Katherine. It’s such a joy to read and the illustrations are simply gorgeous. Thank you for sharing. Thank you! Made my day.